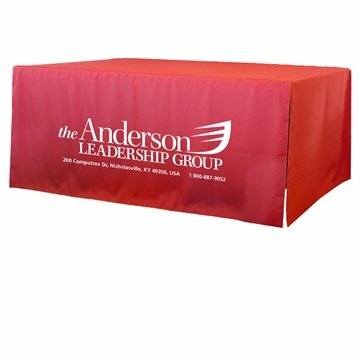 Our new Budget Priced 3-Sided Table Covers cover the front and sides of a table,with open cuts on the corners and an uncovered backside. This cut style allows for big savings. Made from Premium Weight 340D Polyester tear resistant fabric. No ironing or dry cleaning required,machine washable. Available for 6' and 8' tables. Very pleased with our personalized table cloth!! Exactly like the one we ordered a couple years ago. Perfect! Thanks AnyPromo! The cover was perfect. The material was better quality than we expected. Production and shipping was accurate and prompt as always. Thank you! Liked most: Everything looked so good. The quality of this item is definitely excellent.